Hibs kid Alex Harris will today have a further scan to assess the full extent of the ankle injury he suffered during the opening game of the new Scottish Premiership season. The 18-year-old winger limped out of the action against Motherwell after being caught by Fir Park defender Shaun Hutchinson, a challenge which earned him a yellow card but left Harris in obvious pain as his opponent’s full weight fell on his right ankle. Harris was taken from the pitch to hospital where an initial examination revealed the good news that there was no break, but while ligament damage is feared, his ankle was so badly swollen medics were unable to fully ascertain the extent of an injury which will rule him out of this weekend’s derby at Tynecastle at least. 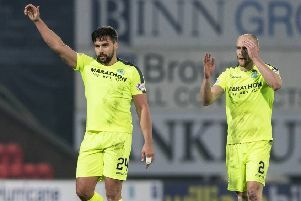 The loss of Harris is yet another blow for Fenlon who has found his future as Easter Road boss in question following three straight defeats, the Irishman, having gone into the Motherwell game stripped of the services of captain James McPake, Tim Clancy, Paul Cairney and Bradley Donaldson through injury. None of them are expected to be fit to face Hearts on Sunday but Ryan McGivern, who was on the bench at the weekend having been ruled out of the Europa League games against Malmo with a knee injury, looks set to return while striker Rowan Vine and teenage centre-half Jordon Forster will be available after serving one-match suspensions. Meanwhile, fans will have the opportunity to wear the specially commissioned shirts worn by Fenlon’s players against Motherwell to mark the death of Lawrie Reilly, the last member of the Famous Five, and the specially branded T-shirts they wore during their warm-up. The shirts, embroidered with Reilly’s name, can be purchased for £250 and the T-shirts for £50 with all proceeds going to the Reilly family’s chosen charity, the Lothian Health Foundation. Call 656-7074 or 656-7072. HIBS Under-20s kick-off their season by facing Ross County at Grant Street Park, Inverness, tonight (7pm).